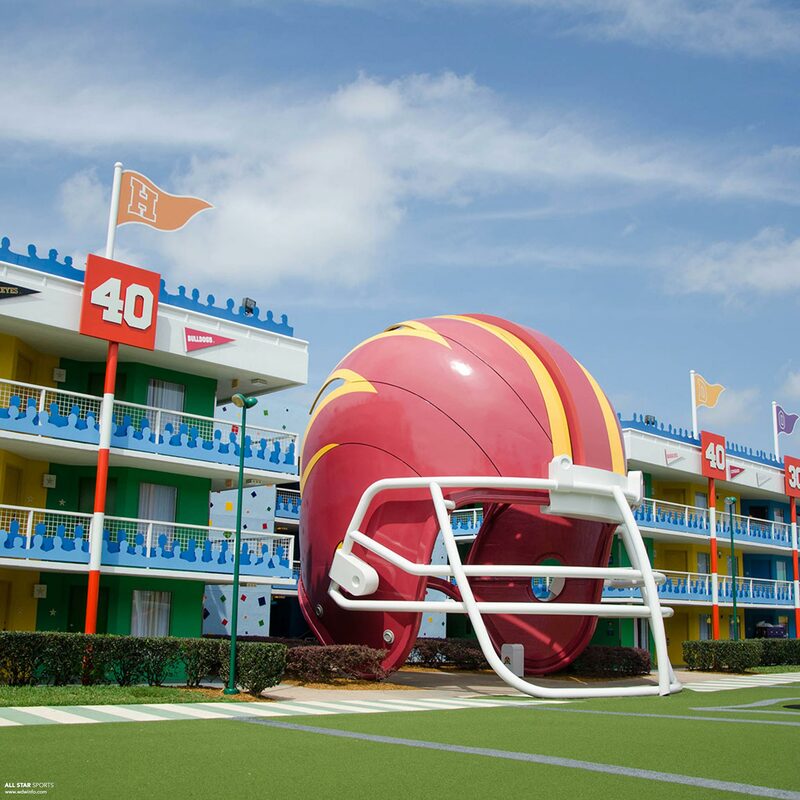 It is week two of our second round of ‘7 Walt Disney World Resorts in 7 Days!‘ Last week we visited Disney’s Art of Animation Resort, and we’re keeping the theme by going to the last two Value Resorts not yet covered – Disney’s All Star Music and All Star Sports resorts. If you’re not familiar with our Seven Resorts in Seven Days coverage, we did the first round back in January where we covered Port Orleans French Quarter, Port Orleans Riverside, Caribbean Beach, All Star Movies, Pop Century, Animal Kingdom Lodge, andWilderness Lodge. This time around we’re doing things a little bit differently – instead of releasing a resort a day for a week and doing only one DIS Unplugged segment for all of them, we’ll be releasing one or two resorts every Tuesday for the next four weeks with individual podcast segments. This way we were able to spend plenty of time talking about each resort! The main building and lobby in particular are designed with sports references and a billion stars. There are also creepy murals at this resort too, but somehow are less horrifying than their distant cousins at All Star Music. Moving outside to the main room sections of the resort, you go straight into what is my favorite area of the resort. Mainly because it is the least sports-y of all of them: Surfing. The designs are cool and tropical, with shark tails and surfboards which make it feel like a 1960’s beach movie rather than sports overload. 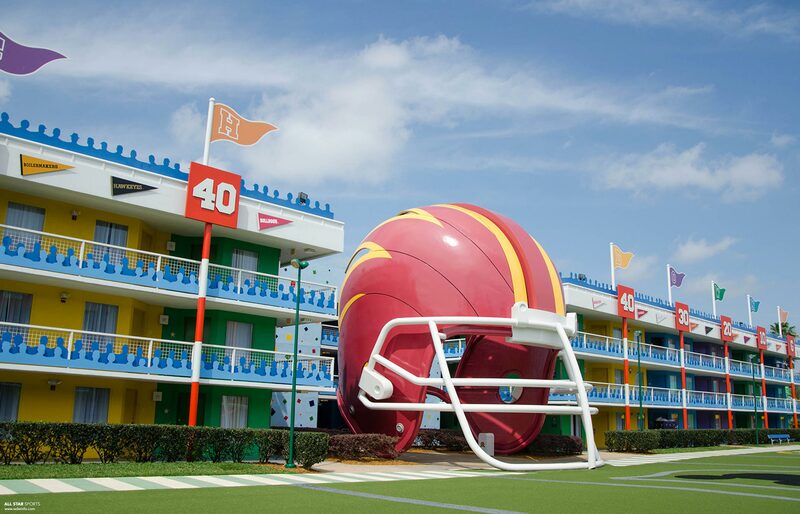 If sports are really your thing though, there are plenty of areas for you to enjoy the theming of the buildings. The basketball section for example contains a lot of fun references to basketballs, nets, and team pendants – and the entrances to each of the buildings is hiding behind big red whistles. Then there is the Tennis section in which the buildings are decorated with rackets, tennis balls, and tennis scores like ’15 All’ and ’15 Love.’ There are also some really cute Huey, Louie, Dewey and Donald statues where the nephews are trying to play baseball while Donald attempts to play tennis. The baseball buildings are very Americana feeling with huge Louisville Slugger bats decorating the sides, baseballs, Coca-Cola cups as stairwells, and red, white, and blue banners. Probably the most impressive section of All Star Sports is the football section, which features a huge football field in between the buildings. Two huge team helmets mark the center stairwells of the buildings, and then the theme is completed with scorecards and flags, goal posts, and really cool spectator graphics on the handrails of the upper levels. 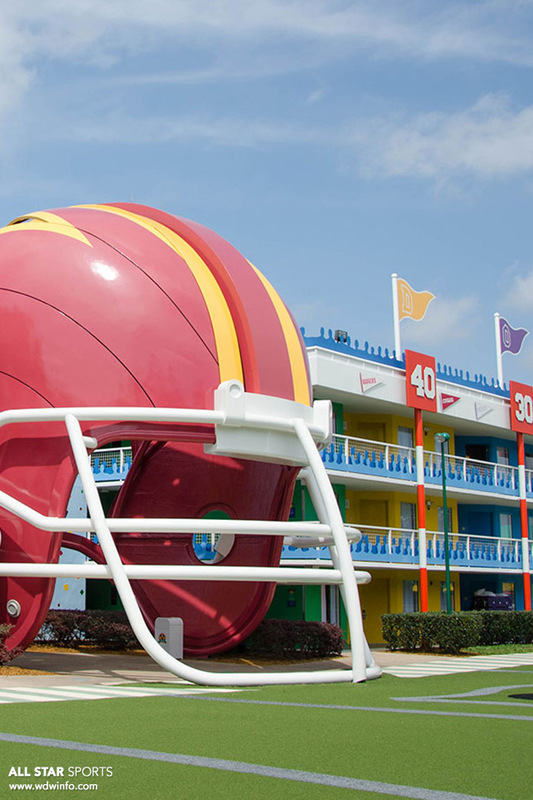 As a treat today, we have a desktop wallpaper featuring one of my favorite views at All Star Sports Resort. You can download for your computer, iPhone, or iPad. Hope you like them – enjoy! 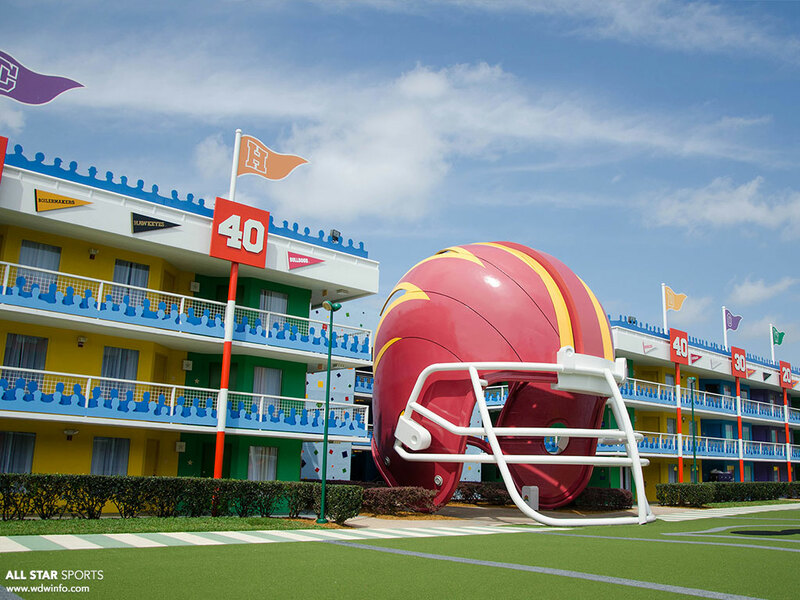 That will do it for our second week of ‘7 Walt Disney World Resorts in 7 Days – Part Deux!’ Have any tips on All Star Sports Resort? Share them with us in the comments below! Be sure to check out our other All Star Sports coverage including our DIS Unplugged segment and our overview videos! Also, be sure to follow us on Facebook and Twitter to find out all the latest Disney news from The DIS! Tune in next week as we cover two more Walt Disney Resorts!